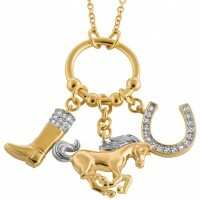 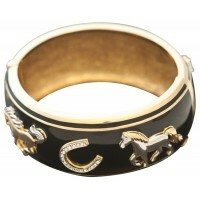 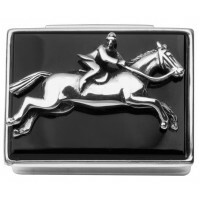 A striking selection of collectibles combining premium craftsmanship with an equestrian theme. 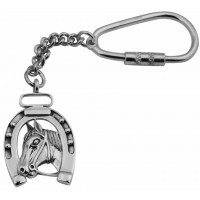 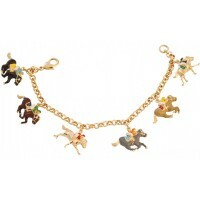 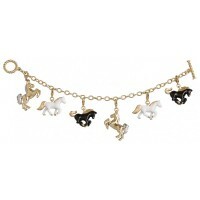 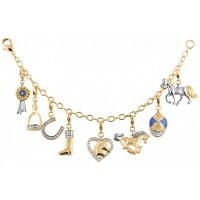 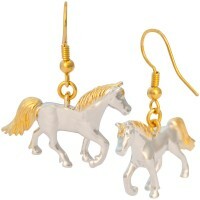 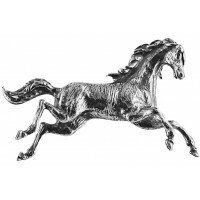 All equine enthusiasts are sure to adore the detail and charm of our personalised silver and gold horse and hound jewellery and gifts UK made, all hand finished and polished by expert British craftsmen. 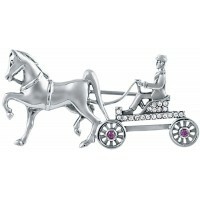 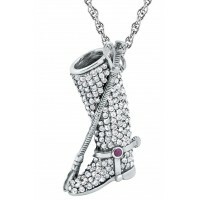 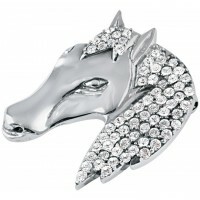 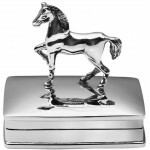 This collection includes; silver equestrian horse brooch and pins, horseshoe cufflinks set with Austrian crystals, a gun dog whistle, horse rider pill boxes, keyrings, pendants and even a stirrup cup. 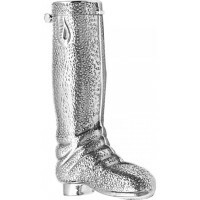 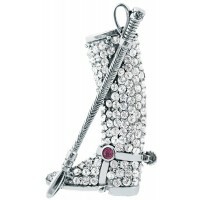 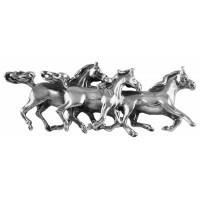 Victorian or Art Deco inspired, let a sterling silver crystal riding boot and crop brooch, fox cufflinks or an equestrian charm brooch add a touch of distinctive elegance to your looks. 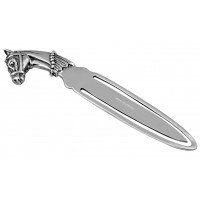 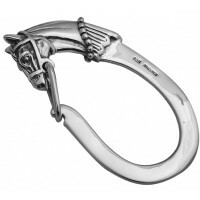 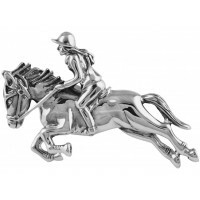 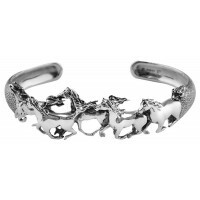 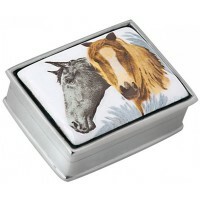 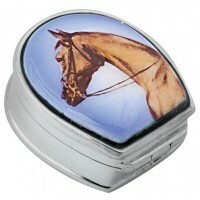 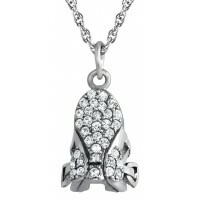 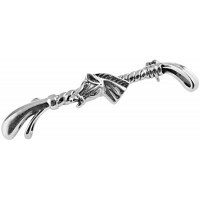 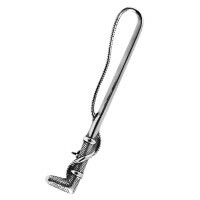 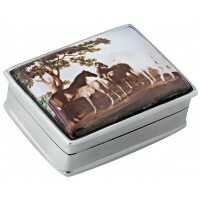 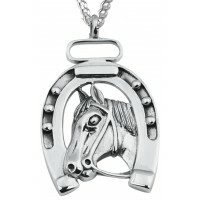 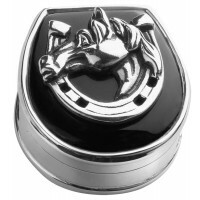 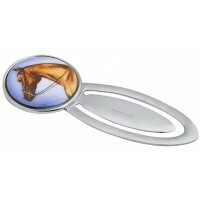 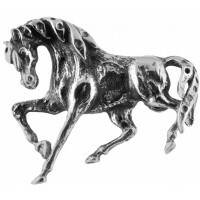 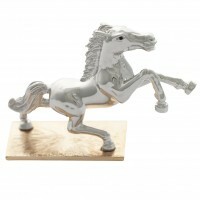 Our Sterling Silver Equestrian Gifts are UK manufatcured and handcrafted to perfection. 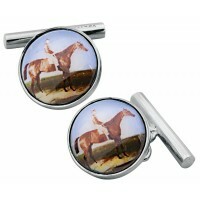 Personalisation options available. 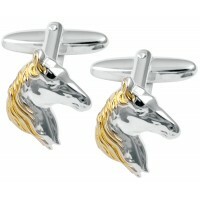 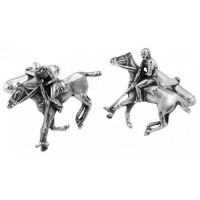 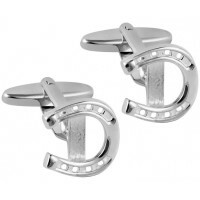 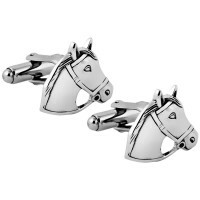 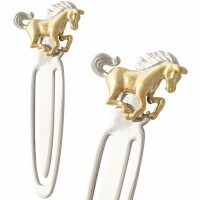 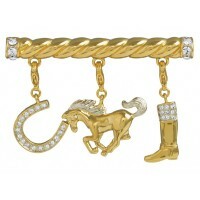 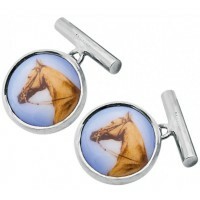 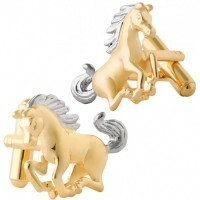 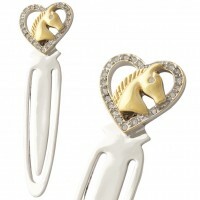 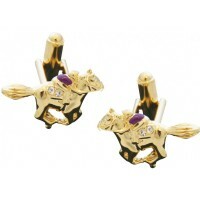 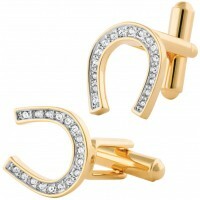 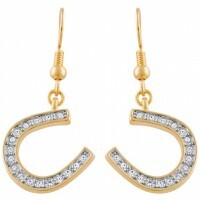 JCU24 Lucky Horseshoe Gold Plate Cufflinks Jewelari of London Exude quality, class and cha..
B404 Horse Riding Crop Brooch Sterling Silver Ari D Norman Our sterling silver horse ..
B415 Horse Brooch Sterling Silver Ari D Norman An ideal present for any horse lover, ..
B436 Horse Racing Brooch Sterling Silver Ari D Norman Give as a gift to the aspiring ..
B439 Horse Head on Crop Brooch Sterling Silver Ari D Norman Sure to attract att..
B440 Galloping Horse Brooch Sterling Silver Ari D Norman Highly detailed, our gallopi..
B620 Crystal Horse Head Brooch Sterling Silver Ari D Norman Admire the true beauty an..
B623 Crystal Horse and Carriage Brooch Sterling Silver Ari D Norman Why not treat you..
B624 Crystal Riding Boot and Crop Brooch Sterling Silver Ari D Norman Handmade in Bri..
B640 Galloping Horses Brooch Sterling Silver Ari D Norman Featuring three beautifully craf..
BE431 Galloping Horses Bangle Sterling Silver Ari D Norman This beautiful sterling si..
CU384 Ari D Norman Sterling Silver Enamel Horse Rider Cufflinks These distinctive men’s cu..
CU458 Ari D Norman Sterling Silver Enamel Horse Cufflinks These men’s cufflinks are a must..
CU481 Ari D Norman Sterling Silver Horseshoe Cufflinks Attention all horse-enthusiasts or ..
CU492 Ari D Norman Sterling Silver and Gold Plated Horse Head Cufflinks Featuring an elega..
CU497 Ari D Norman Sterling Silver Horse Head Cufflinks An Ari D. Norman silver men’s gift..
CU541 Ari D Norman Sterling Silver Polo Player Cufflinks A pair of cufflinks can showcase ..
GT22 Enamel Horse Bookmark Sterling Silver Ari D Norman An ideal gift idea for any equestr..
GT848 Horse Bookmark Sterling Silver Ari D Norman Ari D. Norman is world famous for our qu..
JB239 Gold Plated Equestrian Charm Brooch Jewelari of London Why not choose our gold plate..
JBE24 Gold Plated Equestrian Bangle Jewelari of London Our gold plated metal alloy equestr..
JBT17 Gold Plated Equestrian Charm Bracelet With Crystals Jewelari of London The ultimate ..
JBT26 Gold Plated Equestrian Charm Bracelet Jewelari of London Meticulously crafted and ha..
JBT42 Gold Plated Equestrian Charm Bracelet Jewelari of London Our gold plated metal alloy..
JCU23 Gold Plated and Rhodium Plated Galloping Horse Cufflinks Jewelari of London A must h..
JCU30 Gold Plated Jockey on Horse Cufflinks Jewelari of London Our exceptional quality, ha..
JEA34 Gold Plated Lucky Horseshoe Crystal Earrings Jewelari of London These lucky horse sh..
JEA35 Gold and Rhodium Plated Horse Earrings Jewelari of London Our gold and rhodium plate..
JGT27 Galloping Horse Bookmark Jewelari of London If you’re looking for a birthday gift or..
JGT29 Horse Head in Heart Bookmark Jewelari of London This beautiful and decorative rhodiu..
JGT33 Rhodium Plated Horse Figurine Jewelari of London An ideal gift for the equestrian lo..
JK4 Gold Plated Horse Head in Heart Keyring Jewelari of London Show your passion and love ..
Gold and Crystal Equestrian Charm Necklace Beautifully detailed galloping horse charm with both g..
K402 Horse Keyring Sterling Silver Ari D Norman The perfect way to keep all your keys toge..
KPT404 Horseshoe and Head Key Ring Sterling Silver Ari D Norman Our sterling silver horses..
KPT455 Riding Boot and Crop Key Ring Sterling Silver Ari D Norman Complete with a twi..
PB201 Ari D Norman Sterling Silver Onyx Horse Rider Pill Box Inspired by the beauty of hor..
PB301 Ari D Norman Sterling Silver Horse Picture Pill Box Ideal for any equestrian lover, ..
PB305 Ari D Norman Sterling Silver Horses Picture Pill Box This unique sterling silver hor..
PB309 Ari D Norman Sterling Silver Two Horses Picture Pill Box A sterling silver two horse..
PB544 Ari D Norman Sterling Silver Onyx Horseshoe and Horse Head Pill Box Inspired by the ..
PB584 Ari D Norman Sterling Silver Horse Pill Box Our sterling silver horse pill box, feat..
PT279 Crystal Set Riding Saddle Pendant on Chain Sterling Silver Ari D Norman Hanging eleg..
PT280 Crystal and Amethyst Set Riding Boot and Crop Pendant on Chain Sterling Silver Ari D No..
PT404 Lucky Horseshoe Pendant on Chain Sterling Silver Ari D Norman Often referred to as a..
GT57 Victorian Inspired Riding Boot Shaped Pill Box or Toothpick Holder Sterling Silver Ari D..